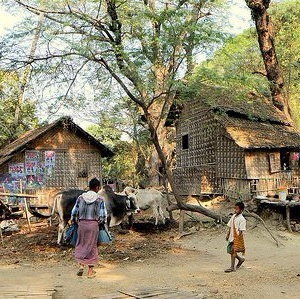 Myanmar (formerly Burma) is a predominantly Buddhist country. But now, through the ministry of GlobalFingerprints, God is opening hearts and entire villages to the gospel. GlobalFingerprints provides a level of care that is unique for child sponsorship programs. Care workers visit each child in their home regularly to assess the child and their living situation. This not only helps them better care for the physical needs of the child, it also provides wonderful opportunities to evangelize and disciple the entire family. In Myanmar, these care workers are actually church planters. Through their home visits they share the gospel and invite families to attend their church. They have been pleasantly surprised by how open people have been to the gospel message. Our Myanmar coordinator recently spoke with these care workers and reported some of their comments. Sanda reports: Children who were hungry were not interested in going to school but since GlobalFingerprints has been providing some food they are eager to learn. Parents have been blessed and we hear testimonies from the parents about the good behavior of their children. The family of one of the sponsored children had been evicted due to not having rent money and had no place to go. GlobalFingerprints paid for three months of rent and now the entire village accepts the care workers. Thura reports: When we have the children, we have the entire family. Home visits are welcomed and we are shown great love by the parents. Also, we have been praying for approval from parents to allow 11 children to be baptized and five have given their approval. Wunna reports: I work in a very poor village and in the past when difficulties came children would stop going to school. Also, the village had many health issues and no money to take the children to a clinic. With GlobalFingerprints, children continue to go to school and children can now go to the clinic for help. GlobalFingerprints now provides greater access to the community as parents are trusting the care workers. The villagers are curious as to why the care workers care for the children and they are more open to accept them. Through GlobalFingerprints six adults were baptized in the last few months. We praise God that through your prayers and contributions entire villages are open to the gospel message and many children and adults are putting their faith in Christ. Next What Makes GlobalFingerprints Unique?